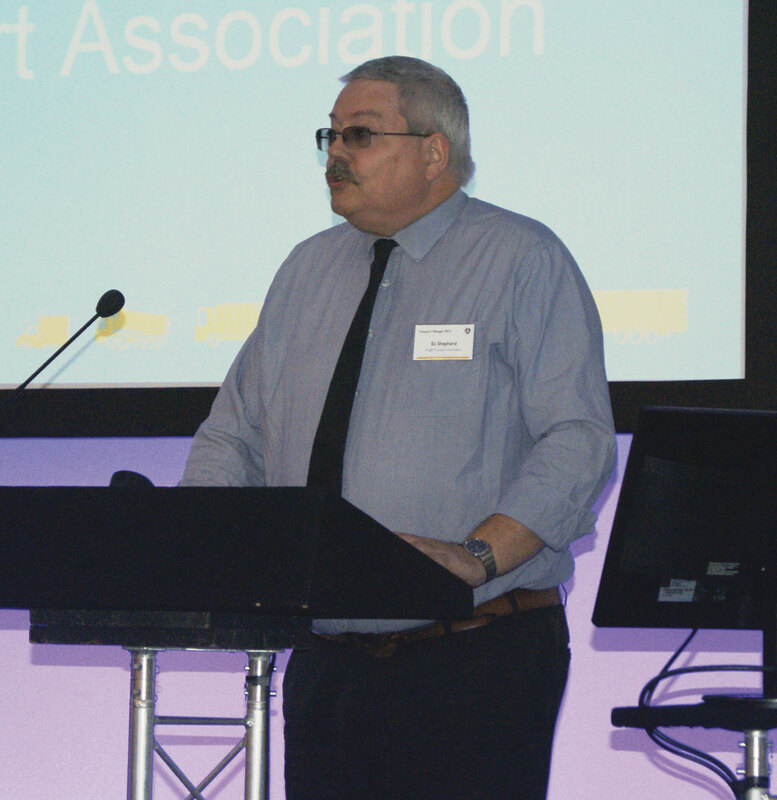 From Traffic Commissioners to Highways England, there was a wide range of presentations at the recent FTA (Freight Transport Association) Transport Manager 2015 event in Peterborough. 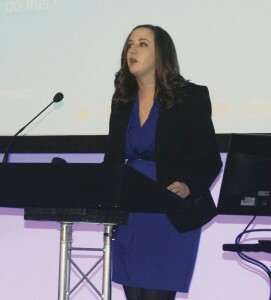 With the purpose of outlining the major issues Transport Managers should be aware of, the event was one of several being held across the country. Although organised by the FTA, there was plenty of interest for those in the bus and coach industry in the content. Always an entertaining speaker is Richard Turfitt, Traffic Commissioner for the East of England. Richard was first to speak and chose the topic of the ‘enormous change’ the Traffic Commissioner’s office is currently going through. ‘We are having a good look at ourselves and our services,’ he said. Traffic Commissioner for the East of England, Richard Turfitt. He outlined four strategic priorities for the organisation: Modernising the operator licensing regime; concentrating even more on the operators deemed to be of highest risk on the roads; reviewing and modernising the regulation of commercial vehicle drivers; and improving the reliability of registered bus services. The real impetus of the changes being implemented by the Commissioners, Richard explained, is to modernise the licensing system. The number of applications dealt with by the Commissioners’ Leeds office is ‘far too high’. He said the organisation needs to get them moving better, with less ‘ping-ponging’ of letters between operator and office. To do this, the skill level of the staff at Leeds needs to be improved, he said. 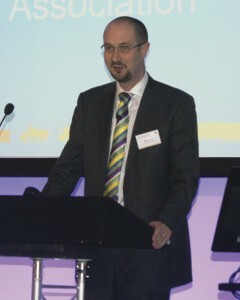 FTA’s Head of Licensing Policy and Compliance Information, James Firth. Richard encouraged the audience to take notice of the non-exhaustive list of the types of activities that might be expected of a Transport Manager, available from the Commissioners. ‘If you do all of these things, then you won’t see me,’ he said. Another development the Commissioners are looking at is trialling other types of interventions with operators. It was mentioned that it would be empowering the individual transport offices to conduct initial hearings. 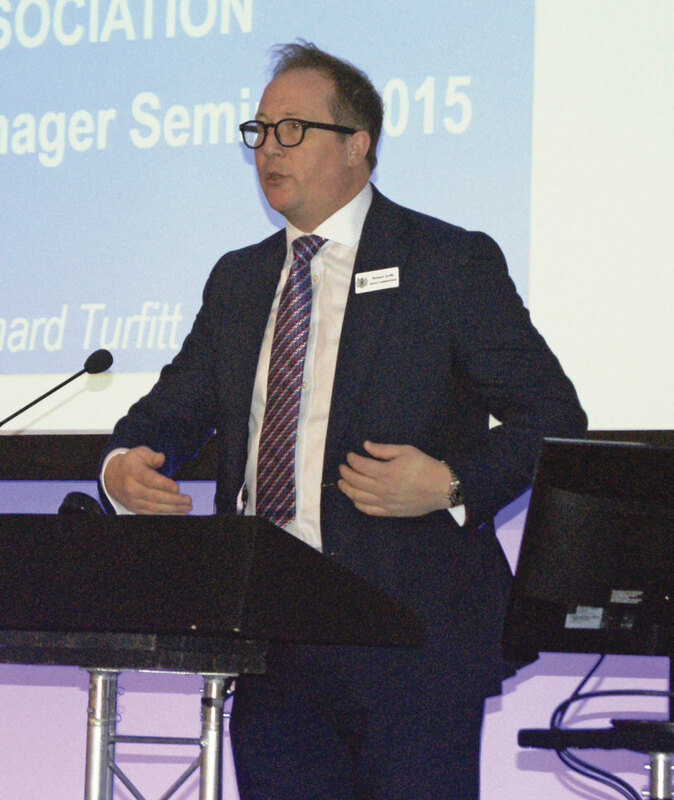 To finish, Richard gave the ‘TC’s top tips for TMs’, which firstly included avoiding the absent Transport Manager. ‘We see these sorts of people in our position as Traffic Commissioners; they come in to the depot and drink tea every now and again, then disappear,’ he said. He advised paying close attention to preventative maintenance inspections, driver detectable defects and annual tests, as well as drivers’ vocational entitlements. His final advice was simply to keep up to date with all necessary duties and paper work. 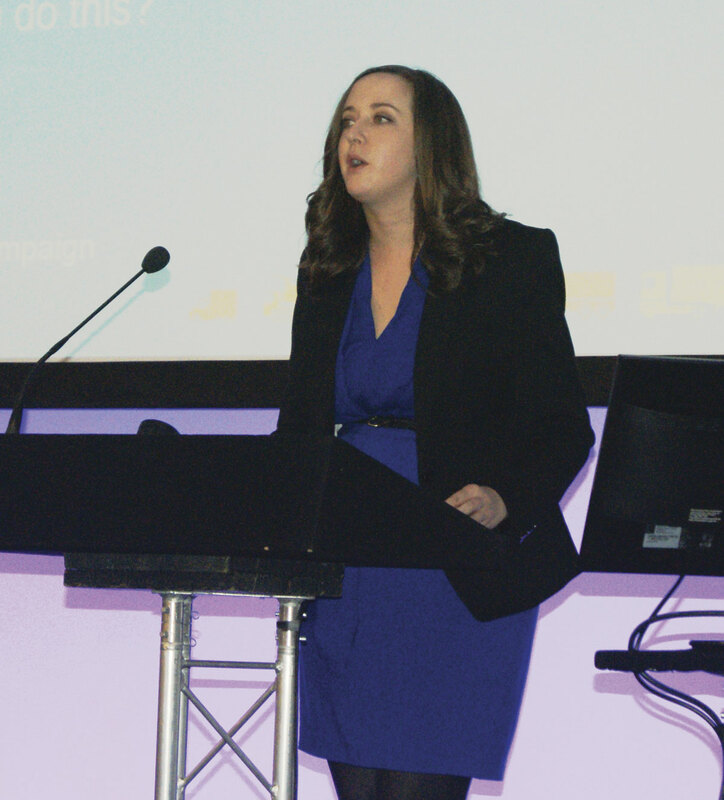 Next to speak was Caroline Hicks, Head of Enforcement Transformation at DVSA, who explained the organisation’s developments in enforcement. She explained the DVSA is currently trying to focus more on compliance. It has improved its methods of targeting those that may be at risk of having major compliance issues, making more interventions but at the right level. DVSA is introducing ‘nudge’ interventions, where it finds people whose compliance is falling and ensuring they know about it. It has brought in what Caroline describes as robust processes to identify non-compliance, using predictive analytics to identify operators with decreasing compliance levels. It is delivering a new level of intervention, which it has trialled in the south west and is going to be rolled out into the eastern region by the end of the year. Instead of visiting depots and requiring everything to be dropped in order to deal with them, the organisation now only requires operators to send documents to them. This it believes allows the operator to deal with them at a more convenient time, but Caroline said it is ‘not a cheat’s charter’. She advised operators to talk to trade bodies if unsure of what information to send the DVSA. Caroline warned operators never to ignore these communications, as DVSA will take this as an indication you do not want to comply. DVSA is now in the process of rolling out automatic number plate recognition (ANPR) technology to profile targeted operators. It is using mapping software to work out when and where these fleets run, with the increased data sets making it easier to target potentially problematic operators. It is developing an Earned Recognition programme, which identifies ways to reduce the enforcement burden on those who have a demonstrable culture of compliance. It is working with the FTA and other trade bodies and will be delivered by highly skilled examiners. Head of Licensing Policy and Compliance Information, FTA, James Firth, spoke about air quality issues, an area he says is gaining much more attention of late. He said there is a demonisation of diesel vehicles in relation to this, which he says is not the main culprit but part of the problem. developing frameworks for LEZs too, with Glasgow and Aberdeen the most likely to roll them out. DEFRA is putting in place guidelines for similar projects throughout the UK, with cities in England possibly in line for an LEZ. An action to take in preparation of this, claims James, is to use Euro6 where possible, introduce driver training to lower emissions, as well as using alternative fuels and low carbon technology, the latter of which James claims will get most attention and approval. He also believes there needs to be more public refuelling infrastructure for alternative fuels, which is something FTA is lobbying for. With the Volkswagen scandal a recent memory, he added it would be amiss not to mention the concerns over the accuracy of real world emissions standards of vehicles. Following James’ talk, information was given from John Comer, Truck Product Manager – Volvo Trucks UK & Ireland, on Volvo’s Euro6 truck engines. 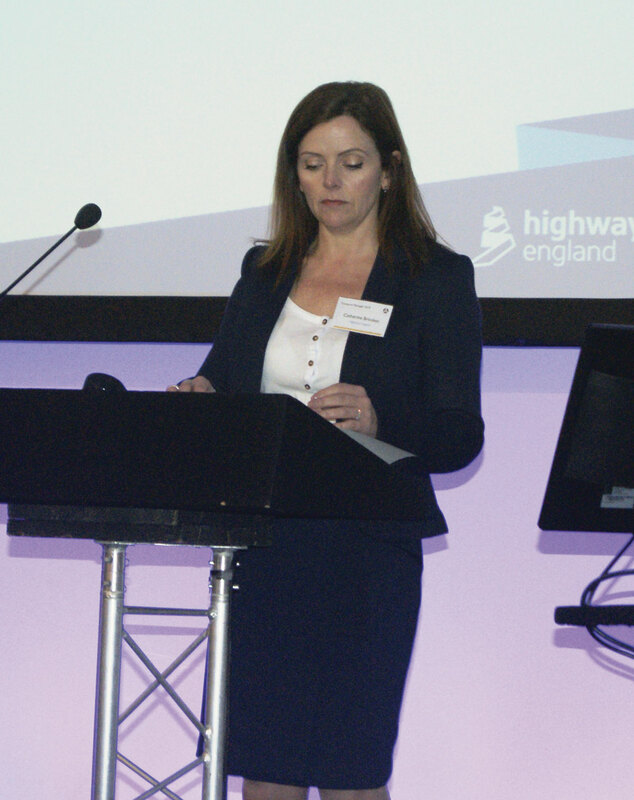 East Divisional Director, Highways England, Catherine Brookes, updated the audience on what is being done on the country’s major road networks. She began by saying the country’s major highways comprise 2% of the road network as a whole, yet carry 4m people each day. One of the biggest problems is the constant struggle with traffic, she claims. Highways England was formed in April this year as a public service company, owned by the government but with commercial freedom. It has been tasked with delivering the country’s investment plan for roads. To achieve this, she said her organisation has been given ‘more long term funding’, which she says has enabled it to respond ‘positively’ and to ‘speed delivery’. 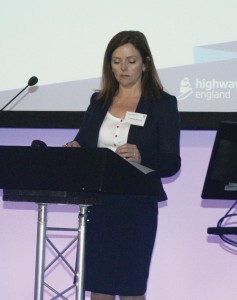 East Divisional Director, Highways England, Catherine Brookes. One of the aims of the funding strategy is to support economic growth through 112 major improvements. It believes with the £7.7bn of capital investment it is to make in the network, it will achieve £4 of benefits to the economy for every £1 spent. It aims to accomplish this through reducing average delay times and implementing better route strategies. A safe and serviceable network is another goal. It aims to achieve this not only through putting in place infrastructure but also by trying to influence driver behaviour and through vehicle technology. Investment is also planned for improving the environment, both natural and built. The focus will be on mitigating noise from the roads and encouraging bio-diversity. As well as ten pilot schemes in place to enhance air quality, it will also be looking at improving resilience to flooding and water quality. Another interesting area it seeks to support is park and ride schemes. To ensure Highways England is targeting the right areas, it is engaging in an extensive customer insight research project that identifies motorist and passenger pain points. Following Catherine’s presentation, a video was played presenting the work Transport Focus does. The consumer body is a progression from Passenger Focus, with the change of name representing the watchdog’s increased role into not just passenger transport issues but those affecting road users in general. James Firth from FTA advised it is important for the industry to get involved with what Transport Focus is doing. Len Mifsud, Marketing Manager at telematics company, Microlise Ltd, polled those in attendance on what they use telematics for. The company was in the reception area during the lunch break, demonstrating its telematics devices. It was promoting its driver performance manager (DPM) app, which drivers can use to monitor their driving performance. The lunch break proved a good time to network, as a number of companies and organisations were on hand to talk to visitors and show them their products. Brigade Electroics promoted its mobile digital recording system for CCTV, Backsense radar sensors, ultrasonic obstacle detection and its Backeye 360 camera monitoring equipment. 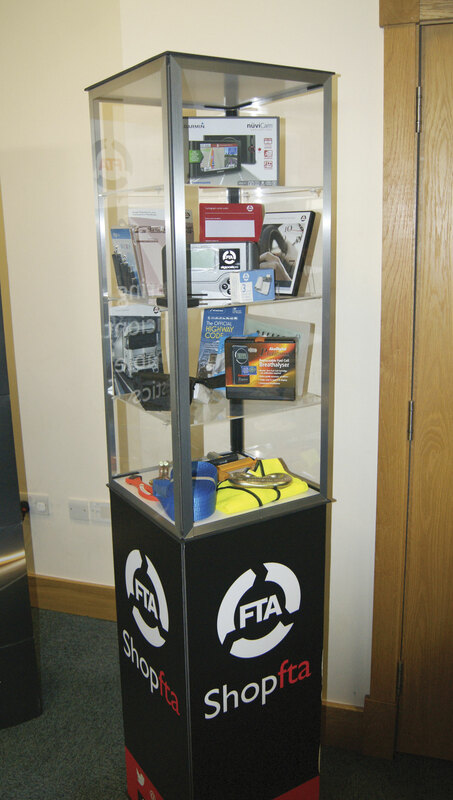 Unsurprisingly FTA had a stand, featuring its many services and offerings. Amongst them was its VisionFTA fleet management software, which incorporates its tachograph analysis package. offence to cause or permit somebody to drive without one. This, he said, is why licenses should be checked regularly. Head of Member Advice, FTA, Es Shepherd. A system is currently being developed that creates a username and password to allow access to online systems run by the government featuring driver licences. This is expected to allow access to O licences too in the future. DVLA has a business to business solution called Access to Driving Data (ADD), which allows operators real time access to the Agency’s database. It is not cheap though, with the initial cost in the region of £30,000, with £6,000 annual rent and a £1.50 charge for each query. It is also possible for drivers to phone DVLA and leave permission for operators to access their driving licence details. The driver has to be in attendance when the operator calls though. Es reminded the audience that non-GB drivers must register with DVLA within 12 months of becoming a resident of the UK. These details are then kept in a separate IT platform. To check the details, the driver contacts DVLA to leave permission for their employer to access the licence details. The check must be made within one week. Es says it is best practice to make these checks at least twice a year, three times if possible. Another piece of advice is to keep a paper trail of all checks made. Next on Es’s list was Section 88 permits for driving licenses, which allows a driver to drive if they have previously had a licence from the DVLA. This comes in handy for anyone having their licence reviewed for say a medical condition, a process that can take a considerable amount of time (occasionally up to 60 days). Technically, if they are found to not be entitled to a licence following the review, any driving they did whilst their licence was under review would have been unlawful. However, Es said there is ‘light at the end of the tunnel’, as section 88 can be used if the applicant is confident the licence will not be refused on medical grounds and they held a valid licence before applying. Section 88 will not cover high risk drivers though, which includes people who have been convicted of two or more driving offences in the space of several years. The cover ceases once the driver receives their new licence. Es suggests checking with insurance companies before driving under section 88 and reminds that it only covers the UK, so no overseas driving is allowed on it. He also advised getting a letter from a GP certifying the driver as being fit to drive. Drug driving was another subject touched on, bringing to the fore the new legislation brought in earlier this year that make it illegal to drive if a person has a certain level of drugs in their body. There are 17 legal and illegal drugs included in the list, nine of which can be prescribed by doctors and are available over the counter. Es’s next topic was disciplining members of staff. He said once an incident occurs when an employee requires disciplinary action, the first thing to do is to discuss what needs to be done. If they are a driver and they have been disqualified from driving, then is it possible for them to have a non-driving job for a period while they are disqualified? It is important a driver is informed in writing too, he said. HR Business partner, FTA, Kathleen Howse. HR Business partner, FTA, Kathleen Howse, discussed ways to attract more staff. She said the third hardest job to fill in the UK is a driver role. To make it easier to attract these much sought after members of staff, she suggested focusing on making your brand attractive, showing that it is a good place to work. She gave the tip of focusing on training, benefits and employee engagement. Make sure to differentiate the brand too, she said. Following Kathleen was Keith Gray, General Manager – Training, FTA, who looked at Driver CPC training. On a graph, he noted how as the deadline for achieving the required training to meet the CPC requirements neared, the price of training increased. The price now appears to be levelling out he observed. He suggests treating this training as professional development, rather than a mandatory thing employees are required to do. One tip was to have the MD or Traffic Manager introduce the training session to the employees and to lay on lunch. ‘Drivers appreciate that,’ he said. Keith also gave some insight into why there is such a driver shortage. Firstly, there is the drop in birth rate in the 90s, so there are simply less younger people about to take on the job. Secondly, the number of 17 to 20 years olds going for a car driving licence has decreased. 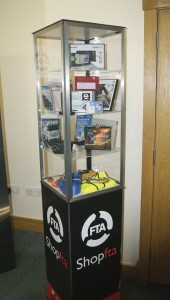 Products on display on FTA’s stand.